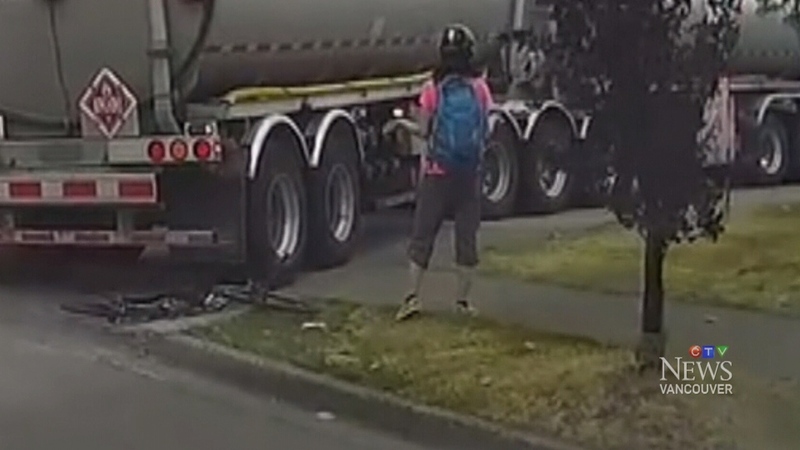 Dashboard camera video captured in East Vancouver shows a close call between a cyclist and a tanker truck that ended with the bicycle being flattened by the massive vehicle and the cyclist narrowly avoiding injury. The incident occurred in front of the Mobil gas station adjacent to the Real Canadian Superstore on Rupert Street at Grandview Highway. The video shows the truck going straight in the right hand lane as the cyclist rides beside him in a marked bike lane. The trucker signals, then turns right second later, cutting off the female cyclist who stopped short of running into the fuel trailer, but close enough that her front wheel was caught in its tires, pulling in the bike under and crushing it as it kept going without pause. "People are just really shocked by it and it becomes personal because you think it could be me," Richard Campbell of the BC Cycling Coalition told CTV News Friday. The video ends with the totalled bike lying on the curb as the vehicle pulls away. Cycling advocates say the incident is yet another reminder of why roads need to be made safer for those on two wheels, including keeping double trailers with large blind spots out of high-traffic areas. "I think it's just too tough for a driver to manage with everything going on," Campbell said. "I think banning those trucks in situations like this would be great." It's a move the federal government is considering as part of an ongoing analysis it calls the "Vulnerable Road Users and Heavy Vehicle Countermeasures Project." An online summary of the initiative cites "gradually limiting the flow of vehicles with high blind spots in designated areas" as one potential way of protecting cyclists and pedestrians in collision-prone areas. The project was prompted by the dump-truck related deaths of cyclists in Ottawa and Montreal. In Vancouver, where bike lanes remain one of the most divisive issues in municipal politics, cyclists are often blamed for questionable manoeuvres on the road. But in the case, the general consensus is that the truck driver was at fault—even among those in the trucking industry. "(The cyclist) was next to him for a good amount of time, so he should've been able to see her," said Ana Bilbija of the Gold Star Professional Driving School. According to Bilbija, trained drivers have to know how to handle the height of the cab and be able to assess how close everyone is around them, but they also consistently have to check their mirrors for blind spots. "When you're operating a big piece of equipment like that, you have to check those mirrors constantly and that's what we teach our students," she said. "You've got to check them every two, three seconds." Vancouver police said they have not been made aware of Thursday's incident and are not currently investigating.